An amusing, fast-paced tale about an irrepressible drama queen who has to cope when she doesn’t get the starring role in the class play. Zaritza Dalrymple, 11, wants nothing more than to be an actress. So naturally, she’s thrilled about the upcoming visit of a theater troupe that will be helping her class stage a production of Calamity Jane. But to be allowed to participate, Zaritza must hand in her math homework assignments, which means she actually has to do them, an option she had barely considered. 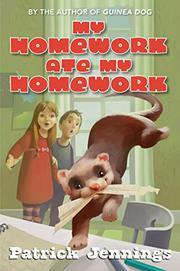 When she gets this show-stopping news, Zaritza immediately leaps into action, first telling her teacher the class ferret ate it, then trying to copy her friend’s homework, then attempting to con her shy, supersmart classmate, Eden Sumarta, into doing it for her. Alas, all ruses fail. Not only that, but the introverted Eden, a girl who never projected past the footlights in her life, is cast as Jane. After some guilt tripping from her parents, Zaritza, who initially would have liked to break Eden’s leg, begins helping her. The girls develop an unlikely alliance, and much to her surprise, Zaritza begins to root for her success. The climactic performance is suspenseful fun, and Zaritza, who becomes more appealing as the novel progresses, even learns a life lesson or two.